The vital role of Merchant Navy seamen in the Battle of the Atlantic, the longest continuous military campaign of World War Two, is often downplayed or forgotten. So, to honour these men who unquestioningly risked their lives to sustain the country throughout the bleakest of times, The London Mint Office yesterday donated a specially designed set of ‘Battle of Atlantic’ coins to HQS Wellington which serves as a floating museum and the livery hall of the Honourable Company of Master Mariners where they will be on permanent display. As well as telling the story of the Battle of Atlantic through the words of the famous Merchant Navy Poem, ‘For All Seafarers’, written by poet laureate John Edward Masefield, the coins have an indelible link to the Battle. Each is made from silver recovered from the wreck of merchant vessel the SS Gairsoppa which was sunk by a German U-Boat torpedo 75 years ago this month, sending 85 Merchant Mariners to their death. The ceremonial unveiling of the new coin exhibit, which took place last night, Tuesday 23rd February on board HQS Wellington, was attended Captain Ian McNaught who is Trinity House Captain and former Master of QE2, Captain John Sail MNI, Chairman of the Merchant Navy Association and, as guest of honour, Battle of Atlantic veteran, Ron Quested, who also received the same coin collection in recognition of his bravery. 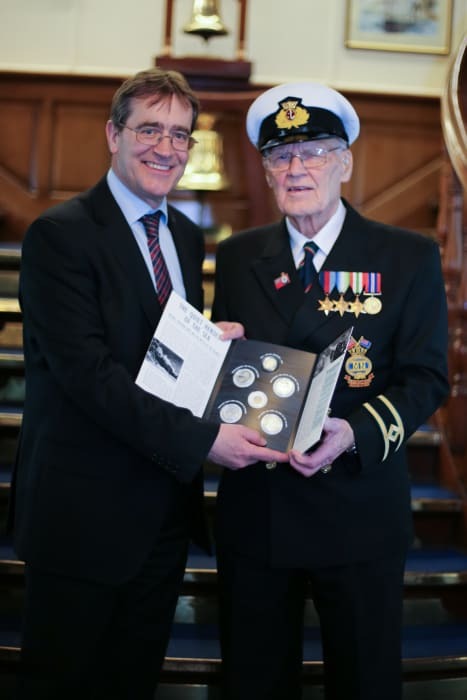 A limited number of the same set of Battle of Atlantic coins, also made from ‘Gairsoppa silver’ will be made available for sale to the public – enquiries and purchases can be made via by calling 0330 024 1001. The revenue from the sale of the coins will fund a donation from The London Mint Office to the Merchant Navy Association which works tirelessly to bring recognition to Merchant Navy veterans and of the critical and strategic role of the Merchant Navy in times of war and conflict. The Battle of Atlantic coin set comprises five coins which have been issued by the Government of Gibraltar – a fitting issuing country as Gibraltar was heavily involved in the Battle of the Atlantic. During World War II it served a vital role controlling virtually all naval traffic into and out of the Mediterranean Sea from the Atlantic Ocean. In September 1939 war was declared on Germany and the strong possibility of German submarines concentrating in the Strait of Gibraltar and using Spanish port facilities loomed large in Admiralty thinking. Many Merchant vessels passing the strait of Gibraltar risked their lives with the looming U-boat peril to carry raw materials back and forth to the UK. The lead coin – “For All Seafarers” – is a £20 coin which can be purchased for £20. The additional four coins in the set are ‘half crowns’ and they can be bought for £49.99 each - for more information on the set please contact our customer care team on 0800 634 0300. About The London Mint Office Limited: The London Mint Office is a trusted and respected partner for a large number of British coin collectors. Gold, silver and other precious metals have fascinated mankind for many centuries, making coin collecting a popular hobby the world over. The London Mint Office is at the centre of British numismatics, bringing the fascinating world of coin collecting to both existing and new collectors. Together with our sister organisations across Europe, The London Mint Office provides a wide range of coins from ancient to modern, originating from virtually every country in the world. Visit www.londonmintoffice.org for more information.